After months of rehearsals, costume fittings and finding the perfect shade of green, the theater department at Franklin Heights High School is ready to present “Shrek the Musical” to the masses. 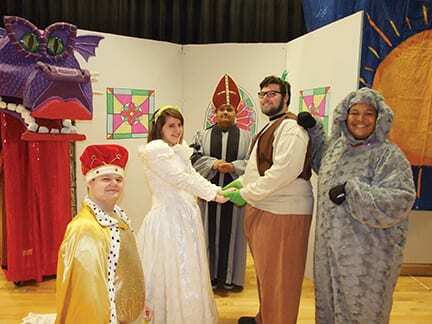 Shown here (from left to right) are principal actors Jacob Harding (Lord Farquaad), Tara Schwartz (Fiona), Austin Eldridge (the Bishop), Tyler Slussar (Shrek) and J’Von Jones (Donkey) during a marriage scene. 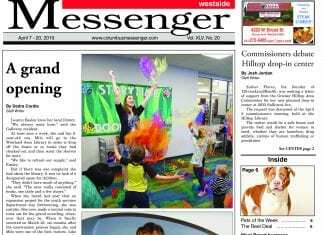 “Shrek the Musical” will be held at the school, located at 1001 Demorest Road, on April 12 at 7 p.m. and April 13 at 2 p.m. and 7 p.m. Tickets are $3 for children and seniors, and $7 for adults and can be purchased at the door.